Call them in for dinner or signal the departure of the school shuttle with this old ship inspired bell. 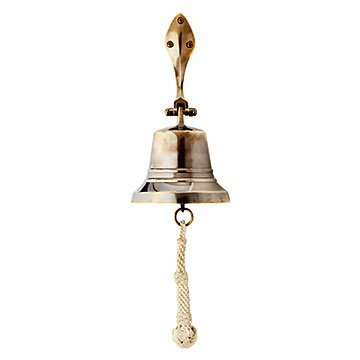 If you were a sailor, the high ding of this bell would mean either: "Break time!" or "Back to work!" For you, it might call the family in for dinner, signal the departure of the school shuttle, or add a charming maritime touch to your decor. The shimmering brass design is complete with a sturdy knotted lanyard to let out a powerful clang that's sure to wake even the heaviest napping teenager—if you were wondering. Hardware is included, and allows you to hang from the wall or ceiling of your beach house, lake house, or just home sweet home. Handmade in India. 4.7" H x 5" Dia. Bought it to serve as a dinner bell for my mom. She absolutely loved it! Great weight to it, and great sound. Liked the design much better than other websites I looked out. Would certainly buy it again. Fair price for quality of the bell.